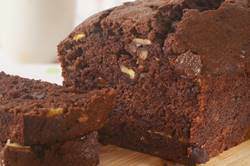 This Chocolate Banana Bread combines the sweet flavor of ripe bananas with chocolate. I have always liked the pairing of chocolate and bananas, but in the past I have been content with just adding some chocolate chips to a regular banana bread batter. But then I decided to take my Banana Bread recipe and add unsweetened cocoa powder to it. The results were excellent; a bread with a mild chocolate flavor yet still retaining the sweetness and moistness that has always made banana bread popular. You will also notice the addition of white chocolate chips to the batter. This not only adds more chocolate flavor, but it also gives a nice color contrast to the dark brown color of the loaf. The finishing touch, if you have some Turbinado or Demerara sugar in the house, is to sprinkle a little over the batter before you pop it in the oven. This gives the crust a nice sugary crunch with a touch of sparkle. Serve this bread in the afternoon with a cup of tea or coffee, but I am not against having a slice for breakfast either. There are many types of bananas, but most of us are familiar with that long and curved bright yellow variety sold in bunches. Arriving at our shores over a hundred years ago, this tropical dessert fruit has many virtues; available year round, reasonably priced, of consistent quality, easy to peel, but most importantly, we know by the color of its skin how firm its flesh will be and how sweet it will taste. When you think about it, not many fruits can tell us so much just by looking at them. Bananas are picked while still green which means its flesh will be hard with little flavor. As time passes and the banana ripens its skin begins to turn yellow and with that its flesh softens and flavor sweetens. Further aging causes the skin to brown and its flesh to become very soft and sweet. At this stage some people throw these bananas in the garbage thinking they have gone bad, not realizing how delicious they will be when mashed and baked in a bread or cake. If you are like me almost every time I buy bananas a few (not enough though to make this bread) will turn brown before I get around to eating them. Instead of throwing them away simply slip them into a plastic bag and place them into the freezer until you have enough for baking. You can also peel and mash them, stir in 1 teaspoon lemon juice for each banana, and freeze in an airtight container or bag. They will keep about six months in the freezer. Chocolate Banana Bread: Preheat oven to 350 degrees F (180 degrees C) and place oven rack to middle position. Butter and flour (or spray with a non stick vegetable/flour spray) the bottom and sides of a 9 x 5 x 3 inch (23 x 13 x 8 cm) loaf pan. Place the nuts on a baking sheet and bake for about 8 - 10 minutes or until lightly toasted. Let cool and then chop coarsely. In a large bowl whisk together the flour, cocoa powder, sugar, baking powder, baking soda, and salt. In a medium-sized bowl combine the mashed bananas, eggs, melted butter, and vanilla. With a rubber spatula or wooden spoon, lightly fold the wet ingredients (banana mixture) into the dry ingredients until just combined and batter is thick and chunky. Fold in the nuts and chocolate chips. Scrape batter into prepared pan and sprinkle the top of the bread with coarse brown sugar (optional). Bake until bread has risen and a toothpick inserted in the center comes out clean, about 55 to 65 minutes. Place on a wire rack to cool and then remove the bread from the pan. Serve warm or at room temperature. Can be covered and stored for a few days, or frozen for longer storage. Makes 1 - 9 x 5 x 3 inch loaf.